There’s a Rainbow Fairy for every colour, each with her own special talent. But when trouble comes to Fairyland, can the fairies stick together to complete the rainbow? Meet Rachel, Kirsty and the Rainbow Fairies and become part of their magical world in the first seven stories from the sparkly, bestselling Rainbow Magic series! I think if you have read this quite a lot you start to get a bit board of it, because its really all the same stuff that happens in them mostly. Read them all in one big book-including flora the fancy dress fairy. BRILL! i think rainbow magic is just like winx club but they hust small fairys. I liked this book a lot but sooned as i started reading more it just began to feel boring this is my 2nd review and im making this short.Bye!.... And remember read,read,read and zoom, zoom ,zoom!! My favourite is ruby the red fairy. I wish I was either Kirsty or Rachel. They seem to have a lot of fun. I am the adventurous kind of person, so I’m kinda jealous of them. 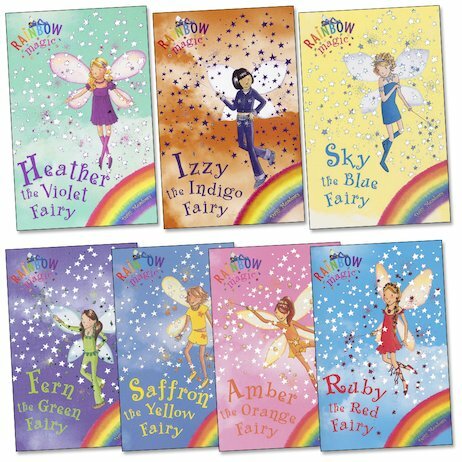 I used to have the Rainbow Magic fairies painted on my wall, I loved the books so much! This set is an enjoyable account of when Rachel and Kirsty helped the Rainbow Fairies to bring the colour back to Fairyland. These are great. They are about all the colour disappearing from fairy land and Rachel and Kirsty trying to find the rainbow fairies so colour can be restored once more in fairyland. i loved it because there was a lot of magical moments and adventures.I loved all the chracters. Loved Ruby dramatic how Rachel,Kirsty and Ruby met YOU MUST READ THEM!!!!!!!!!!!!!!!!!!!!!!!!!!!!!!!!!!!! I have Read them all really good. Soooo execting A great start. This was the first collection of book my Mum bought me they are fantastic and always come with me on sleepovers with my friends. Great story and I love the names they are all my friends names too. I have Read Lots and Lots of RAINBOW FAIRY books but I think these ones are the best . Fairyland lost it’s colour! Can Kirsty and Rachel find the Rainbow Fairies before Fairyland is doomed to be gray?